I thought we could maybe start a thread for all SCOOTER talk and PICS! I think a scooter will make the perfect alternative to a toad. Here are my two Honda CH80's. I have a Honda Reflex. It'll get up and run 70mph and still get awesome fuel mileage. I want a Helix for longer distance travel. They look pretty comfy and I love the storm trooper styling of the 80's Honda designs. i even have bumper mounts for the ct, it would ride nicely on the front bumper of the bus. a few years ago i upgraded to a bigger atv and now i got to tow it. Kudos to you for being the first to be seen ON your scoot! 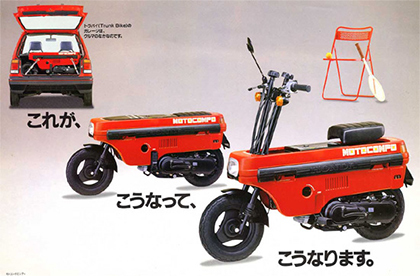 Those old Honda trail mini's are COOL. How do you like the Helix?